what did you do at the british championships daddy? i can already sense the level of affirmation and pride that i selflessly, and entirely on your behalf, arose early of a sunday morn (my day off, if you please) to be present at the start of the women's road race. 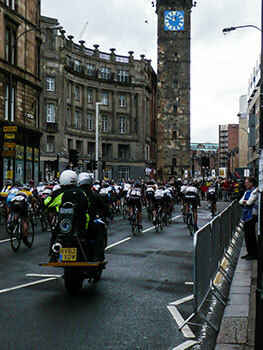 according to the schedule supplied by british cycling, this commenced at 09:30 on glasgow green, some considerable distance from my accommodation in the sauchiehall street region. pausing only to enjoy a double espresso, a smoothie and a little tub of porage with maple syrup (a man has to have standards you know) on my way down buchanan street, i reached the green in plenty of time to acquire my press pass for the day. did i mention it was raining at the time? 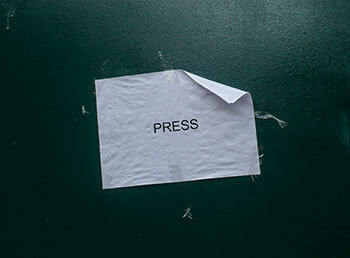 though you would imagine organisation to be heavily weighted to the right side of slick considering this to be the british road race championships, in fact, acquiring a press pass was a rather circuitous affair. though i'm sure (as are you all) that i could write an entire narrative concerning the thrill of this particular chase, to cut it a lot shorter, two photographers and myself were sent to the wrong portakabins where it was apparently necessary to have accreditation to enter the accreditation office. the british cycling clad lady who came to the door informed us that kevin had just left for the finish line with all the press passes, so we should head over in that direction to renew our search. if only any of us had known who kevin was and what he looked like. the road race circuit was identical for the women as it would be for the men come sunday afternoon, though the former were required to cover a few laps less in their quest for gold, silver and bronze. 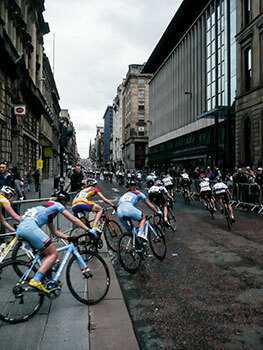 this was apparently the first time a championship course had been held over a city centre course, one that inhabited many of glasgow's principal streets and locations. it does not seem at all churlish at this point, to commend all those responsible for closing the necessary roads and maintaining those closures throughout the day. a job well done. in recognition of such, i thought it important to obtain photographs with definable city backgrounds and landmarks, therefore, having made my way to glasgow green, i now retraced my steps up to the trongate, along argyle street and up to the junction of buchanan street and st vincent street. imagery duly captured, i made my way back to glasgow green. with the women taking approximately twenty minutes per lap, those on the finish line at the green were kept well informed by both hugh porter and a scottish announcer whose name i never did find out. 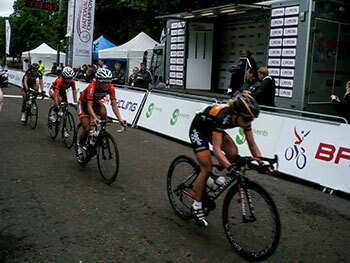 the win was eventually taken by lizzie armitstead, ahead of laura trott and danni king. it was perhaps as well that i acquired such characterful imagery in the morning, for my afternoon was spent in rather more opulent and considerably less stationary surroundings. i would dearly love to give the impression that events such as this are so familiar to me, that the day's proceedings scarcely merited a raising of the heart-rate. but, as many will already be aware (less sniggering at the back please), this is very far from being the case. 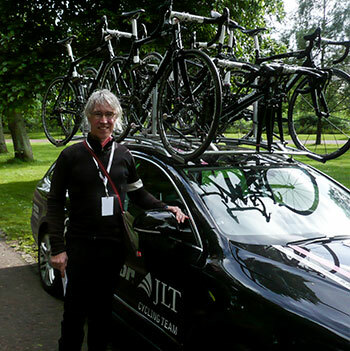 i had e-mailed rapha condor jlt manager, john herety, some days ago to enquire whether, if the team was indeed followed by an appropriately liveried vehicle through the race, might i hitch a lift for perhaps a couple of laps. timing is, as any drummer and comedian well knows, pretty much everything, and his reply indicated that a member of sponsors jardine lloyd thomson and esteemed journalist, will fotheringham were already installed in that particular seat 9not at the same time, i might add). however, plans often change, and in this case, that's exactly what they did, thus leaving the passenger seat of the team skoda vacant for one's rapha clad posterior. though several other team cars made regular pit stops at the feed zone to throw one passenger out and accept a substitute, it appears that no such manoeuvres were required in our case, and i was allowed to spend all thirteen laps of the 14.2km route, seatbelted beside john herety. 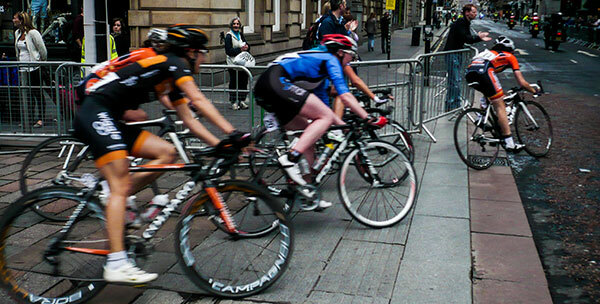 i offer this by way of explanation as to why there are no action photos of david millar, mark cavendish, kristian house or jimmy mccallum framed against the row of crowd barriers along the lower portion of buchanan street. though the contesting british peloton are considerably faster than you or me, i expected to be treated to a relatively sedate ride around the more obscure corners of glasgow's west end. this fancy was rather abruptly destroyed when rcj rider elliot porter (i think it was he; if i am in error, i hope he will forgive the misidentification) unshipped his chain on the start line, and mechanic james performed an impressive 100metre dash from the back seat to have him up and running as speedily as possible. rather decisively, this put him at a disadvantageous distance from a disappearing peloton, and i exaggerate not when i tell you that mr herety's turn of speed in that skoda would have done the mclaren formula one team proud. passing porter, they attempted to motor pace him back to the peloton, and when that failed, the magic spanner was produced and the poor lad was given a roller coaster ride back towards that which he ought to have been with in the first place. again, i'd dearly love to have you all believe that a ride in the front seat of a speeding team car is something that i am so used to, it would be a mere bagatelle. but of course, i have led a sheltered life, not one portion of which has ever seen such an experience. i therefore have to lean heavily upon the considerable knowledge of john herety to understand that the sizeable gaps in the information provided by radio tour were not only not normal, but somewhat infuriating. at the team meeting on saturday eve, lots were drawn for the car positions behind the race; rapha condor jlt drew last of the professional teams meaning we followed the peloton at arms length for around half the race. however, kristian house formed part of a chasing group of four which gradually distanced those we had been respectfully following. by the time the commissaire decided that we, team uk youth, british cycling and netapp endura ought to move up, they were quite some distance ahead, and yet again john herety re-enacted a recent edition of the monaco grand prix. i swear i could hear the breathing of the crowd barriers on each and every corner. another coat of black paint and the door would have come off. team ukyouth's ian wilkinson dropped off the pace on the last lap, leaving scott thwaites and 100% me rider simon yates to head to the finish line in the company of rcj's kristian house. john expected the former two to fight it out for sixth and seventh places, but as we entered glasgow green for the last time, house nipped off the front, leaving the other two to decide who'd take up the chase. that indecision let house gain a decent gap, nabbing sixth spot behind sky's luke rowe who'd been riding in no-man's land chasing peter kennaugh, david millar, ian stannard and eventual winner and british champion 2013, mark cavendish. as is the case at the finale of most races, the team cars were pulled off some distance before the finish, so none of us saw any sprinting or line crossing. but it was a stunningly unique way (for me at least) to view a cycle race. in an almost painful undermining of the apparent glamour of road cycle racing, john had already radioed the guys at the feed zone to make sure all the transponders had been removed from the bikes and that those who had climbed off before the end, ought to have their bikes packed away and organise taxis to take them to the airport and subsequently home. if anyone recognised this rapha team passenger and waved, i apologise unreservedly if i did not respond; somehow, waving from someone else's car seemed a mite ostentatious. 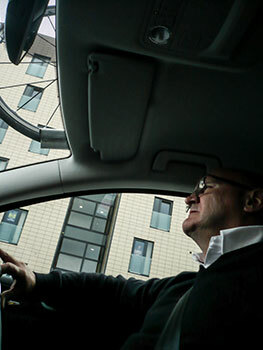 i'd sincerely like to thank all the folks at rapha condor jlt for their forbearance, and especially to john and mechanic james for allowing me to infiltrate their rather fast skoda team car. mark cavendish won't forget this year's edition, and i can assure you, neither will i.